What kit do I need to become a pikeman? 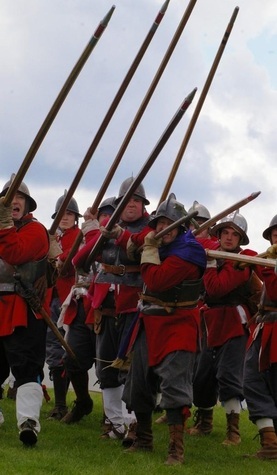 What Kit do you need to be a Pikeman? Knowing what kit you will need to buy to become a pikeman is tricky for new members of any regiment, so here in Hammond's we have taken time to agree a dress code for everyone in the regiment. We have a democratice approach to getting the presentation of the Regiment right. We have so many members with so much experience, we held meetings with all divisions within the regiment - pike, musket, artillery, drums and colours, and camp followers, and agreed between ourselves that there should be a Dress Code for all divisions, separated into three layers of equipment - Basic Kit, First Choice Kit and Finishing Touches. We also have two levels of dress - Parade Order and Battle Order. Parade Order applies in Living History and Parade scenarios, whereas Battle Order is a slightly stripped out version for Sealed Knot musters.